Frantic Mama: Who Are You Wearing? I love connecting with other bloggers, especially those extra smart, witty, empowering women bloggers out there. There is a group of bloggers sharing photos of their very unglamorous-- but no less lovely-- selves. *(To see more of the blogs in this link up, click on the Sunday Parenting Party button on my blog's homepage). So here it is, folks. I don't usually put photos of myself in the blog for various reasons, but this is one of my favorite photos of myself sans primping, make-up, posing, etc, as part of the #365FeministSelfie blog link-up. 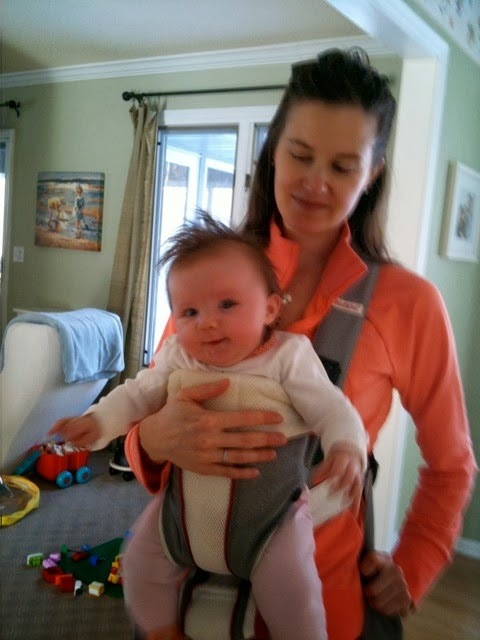 The photo is from Winter 2012 when my daughter was still tiny and I could walk around "wearing" her like this. I'm also donning my favorite, much-loved orange sweatshirt (Hmmm...I'm wearing it as I type this too...about a year after this photo was taken. Probably time for a new one).